Jukido Jujitsu is an art that fuses many principles, techniques, and training methods found in Judo, Karate, combatives, and authentic forms of traditional & modern jujitsu into a dynamic & powerful system of practical self-defense. Weapons training and defense is also gradually integrated into the formula of Jukido Jujitsu. This dynamic jujitsu system is sanctioned by the International Kokondo Association (IKA), which certifies all instructors, standardizes its curriculum, and oversees Jukido Jujitsu & Kokondo Karate dojo worldwide. The Jukido system of jujitsu was formulated and founded in 1959 by the legendary American martial artist pioneer, United States Marine, and jujitsu master – Shihan Paul Arel. Jujitsu, sometimes spelled as jiu-jitsu or jujutsu, is the oldest of the Japanese empty handed fighting arts. 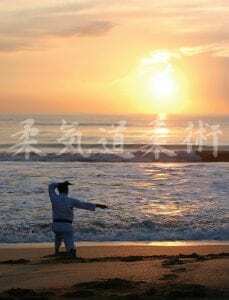 It serves as a parent martial art from which many classical and modern martial arts forms have spawned. Relatively modern styles such as a Judo and Aikido are direct offspring from classical schools of jujitsu. Other arts and styles have also been influenced by jujitsu directly or indirectly, including many karate styles. Jukido Jujitsu stems from old styles of jujitsu in terms of its principles, techniques, and intent. However, it approaches all of these with an updated perspective that is appropriate for the reality of today’s self-defense situations. In part, this means that Jukido Jujitsu is not practiced as a form of sport but rather as a system of practical and effective self-defense. Jukido, or “The Way of Gentle Flowing Power” is among the most comprehensive and effective forms of self-defense in the world. As an authentic style of jujitsu, Jukido is a particularly powerful and practical system of self-defense with the goal of enabling a smaller and weaker person to defend himself against an attacker (or attackers) who is larger and stronger then himself and to do so in both armed & unarmed situations. Jukido Jujitsu does this by teaching students the fundamental principles that allow a skilled practitioner to utilize the strength, size, motion, energy, and anatomy of an attacker to their own advantage. This makes Jukido Jujitsu a perfect choice for people from all walks of life. The art of Jukido has been taught from its earliest days to both children & women, specifically because it is a perfect fit for those who are seemingly more vulnerable. In Jukido Jujitsu the highlight is typically the redirection and manipulation of motion, energy, & anatomy for a powerful (& appropriate) end result. Kuzushi: is the principle of off-balancing. Usually off-balancing is achieved by utilizing motion or energy of an attacker. When a person is over extended or off balance, there is uncontrolled energy in that direction. The defender, with proper balance, distance, and timing will make use of this energy. By adding the attacker’s energy with that of the defender’s a very powerful technique is generated. Shorin-ji (points and circles): is a fundamental principle that is central in Jukido Jujitsu. Shorin-ji promotes speed and fluidity through understanding and use of the “yin-yang” of the circular and linear elements inherent in the fighting space and body dynamics of any combat situation. Jushin: is the principle of attacking and/or controlling an attacker’s centerline(s) and center of gravity. All techniques directed to the attacker’s centerline will be significantly more effective. When a technique is directed to the centerline, the attacker absorbs the entire amount of energy directed to him. When a technique is not on center line, the body will move or rotate. This movement will reduce the amount of energy applied to the target area. Jujitsu is considered among the most versatile forms of martial arts in the existence. Jukido is versatile even within the realm of already comprehensive jujitsu systems. The techniques of Jukido Jujitsu encompass throwing techniques (nage-waza), joint locking techniques (kansetsu-waza), choking techniques (shime-waza), striking techniques (atemi-waza), pressure points, ground fighting (ne-waza), and many other techniques in special situations (cars, against walls, weapon assaults, etc.). Most importantly, Jukido Jujitsu isn’t simply a collection of techniques – the methods in which the strategy, tactics, and principles taught within Jukido Jujitsu are interwoven make it greater than the sum of its parts.